For many folks, growing tomatoes has become a yearly tradition. It's one of the most commonly grown food producing plants in backyard gardens today. Tomato plants have a very high return on investment (ROI). It might sound odd to compare tomatoes to a financial investment, but think about it; If you go the grocery store and buy tomatoes, you'll likely pay $2-$3 per pound. A tomato plant seedling usually costs less than $2 and can easily produce 20-30 pounds of tomatoes. Some varieties produce even more. So with a minimal investment of time and money, raising tomatoes in your backyard makes a lot of economical sense. Homegrown tomatoes just taste better than those you get in a grocery store. This is because you can wait until they are fully ripe, pick them, and eat them in the same day. Tomatoes that come from commercial growers are often picked while still green and under-ripe. They are then gassed to get them to turn red and shipped hundreds or even thousands of miles only to sit on a store shelf for a week or more until someone buys them. Tomatoes are simple to grow - they're easy to plant, easy to care for and easy to harvest. There are hundreds of uses for tomatoes in recipes. 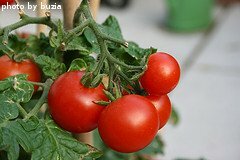 Tomatoes can be easily grown in containers or hanging baskets, as well as in traditional gardens. There are many benefits to eating tomatoes. They are packed with vitamins and minerals. Tomatoes also contain lycopene, which some studies suggest may help lower cancer risks. Technically, tomatoes are fruits. They come in hundreds of different varieties - including several different colors, shapes and sizes. Over the years, many tomatoes have been bred for different qualities - early producing, larger fruits, different colors, different sizes, etc... Heirloom tomatoes have seen a rise in popularity over the last couple of decades. Growing tomatoes of varying sizes and colors adds variety to your garden and your palate. 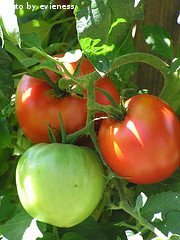 Tomatoes require fertile, well-drained soil and plenty of sun. They typically grow best between 70-90 degrees F. Tomatoes can be grown in both traditional gardens and containers. The seedlings can be transplanted outdoors about 2 weeks after the last expected frost date in your area, when the soil has warmed. Some tomatoes produce very early and can be ready to eat as early as 55 days from the time you transplant them into your garden. Other varieties can take up to 90 days for their fruit to fully ripen. 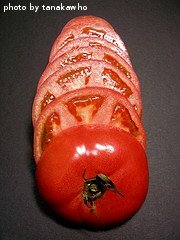 Click on the following links for more information about growing tomatoes.